"India: The Cookbook" is results of two decades of meticulous work of collecting and perfecting thousand of authentic family recipes from all over the Indian subcontinent by author, Pushpesh Pant. "India: The Cookbook" is an encyclopedic guide to Indian recipes, with more than 1,000 recipes from diverse parts of India. In a way, Pushpesh Pant's book is similar to Raghavan Iyer's 660 Curries, where Iyer provided recipes for 660 Indian recipes. 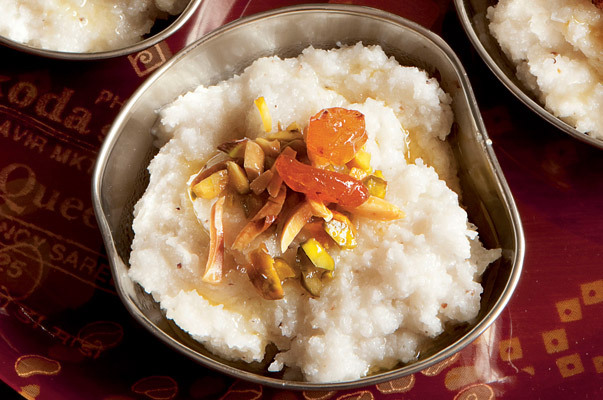 The featured recipes in “India: The Cookbook” are classic traditional recipes without bastardization for western readers. This is a good guide for a novice Indian food enthusiast to find basically any type of Indian recipe with ingredients, cook and prep time, and reasonably accurate description of cooking techniques. However, most recipes do not offer a step-by-step guidance to a complete newbie cook, who has never seen a similar Indian food being made. The book also does not have descriptive text for any of the recipes. For someone completely new to the dish, a list of ingredients and method of preparations are not sufficient. The photographs featured in the book are excellent although, I wish there was photograph for each recipes. 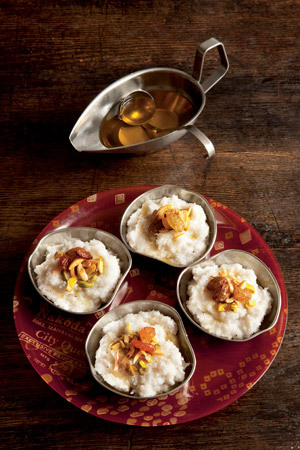 Professor Pant’s culinary adventure encompasses every region of the country and provides 1,000 recipes. Pant’s book is recommended even with some minor editorial problems with the book, such as printing of couple of recipes twice, text, and lack of perfect indexing. If you are going to buy only one Indian cookbook, for sheer number of recipes featured, “India: The Cookbook” is the one. The book came in an Indian grocery bag -- similar to bags that contain Indian Basmati rice, both artsy and marketing savvy. *cardamom is a spice made from the dried pods of the cardamom plant, used in both sweet and savoury dishes, and known as elaichi in India. The most common variety has green pods, while the other has black-brown pods with a more astringent flavour. Ground green cardamom is also available from Asian grocery stores. ** ghee is butter which has been clarified to remove the milk solids and obtain the purified fat. Used to prepare cooked desserts and to cook many Mughal dishes. Soak the rice in a large bowl of water for 1 hour, then drain. Put the rice and coconut in a blender or food processor and process, adding a little water to make a thick paste. Transfer the paste to a large, heavy-based pan, and cook over low heat for 10 minutes. Pour in 250ml / 8fl oz (1 cup) water, add the sugar and simmer for 20 minutes, or until the mixture has a porridge-like consistency. Sprinkle over the ground cardamom and mix well. Spoon into a glass bowl. Heat the ghee in a frying pan (skillet) over low heat, add the nuts and stir-fry for about 3 minutes, or until light brown. Remove and add the raisins to the pan and stir-fry lightly for about 1-2 minutes. Sprinkle over the pudding, then allow to cool completely and serve cold. Discard the stems of the dried red chilies and soak the chilies in a bowl of water for about 15 minutes. Drain and, wearing gloves, deseed before using. Heat the ghee in a large, heavy-based pan over medium heat, add the garlic and stir-fry for 1-2 minutes, or until light golden. Add the onions and cardamom pods and stir-fry for 5-7 minutes, or until the onions are golden brown. Add the meat, increase the heat to high and stir-fry for 4-5 minutes or until the meat changes color. Reduce heat to medium and stir-fry for a further 4-5 minutes. Remove the pan from the heat and stir in the yogurt mixture, the return to the heat and stir-fry for 2-3 minutes, or until the liquid has evaporated. Now add 6 ¼ cups water and bring to a boil. 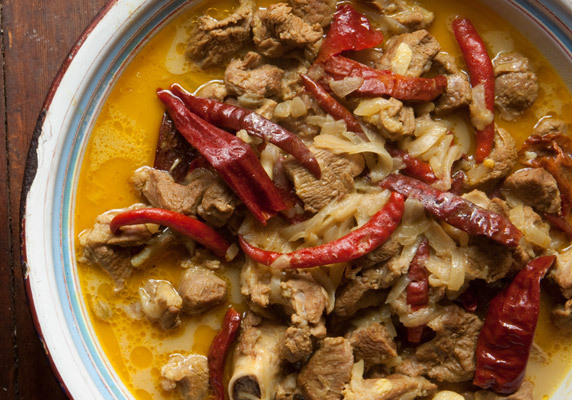 Reduce heat to low, cover and simmer, stirring occasionally, for about 1-1 ½ hours, or until the meat is tender and the sauce is a thin consistency. Remove from the heat and adjust the seasoning, if necessary. Garnish with chopped coriander. 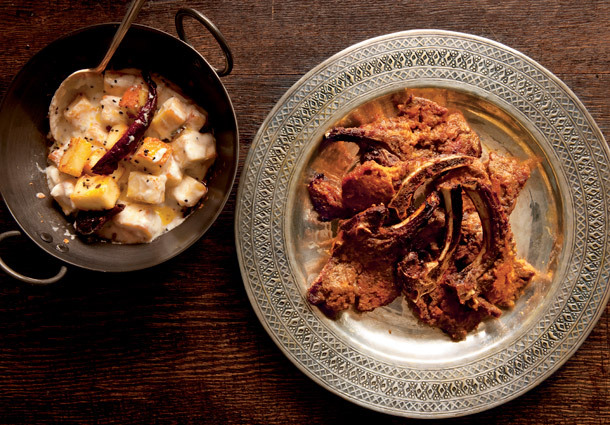 This traditional dish from Rajasthan is famous for its fiery taste and striking crimson color. If you can find them, use Kasmiri dried red chilies, as they are milder than the ordinary ones. To make the first marinade, put the pastes, chopped ginger, vinegar and oil in a large shallow dish. Season with salt and mix well. Add the chops and spread the marinade evenly over to coat. Cover and allow to marinate in the refrigerator for about 6 hours. Mix the yoghurt with all the other ingredients for the second marinade in a large shallow dish. Remove the meat from the first marinade, wiping off any excess moister from the first marinade and add the meat to the second marinade. Cover and allow to marinate in the refrigerator for a further 3 hours. Prepare a tandoor* or charcoal grill for a moderate heat, or alternatively preheat the grill (broiler) to medium. Thread the chops on to metal skewers, leaving 2.5 cm / 1 inch between them. Make sure they do not fall off the skewers. Roast in a moderately hot tandoor, over a charcoal grill or under the hot grill for about 10 minutes. Remove the skewers from the heat and hang up to drain. Put the skewers into a dish and baste with the melted butter, then roast for a further 5 minutes, or until cooked. Serve hot. * Tandor: The clay tandoor oven used in the Indus valley dates as long ago as 3,000 BC. Traditionally they were heated with burning charcoal, but modern tandoor ovens are often heated with electricity. A skilled tandoor cook can manipulate the heat of the oven to bake, roast or grill a variety of foods. Put the garlic in a blender, add 3 tablespoons water and process to make a fine paste. Transfer to a container and chill and in the refrigerator. This paste can be stored for up to 3 days in the refrigerator. Put the ginger in a blender, add 3 tablespoons water and process to make a smooth paste. Transfer to a container and chili in the refrigerator. This paste can be stored for up to 3 days in the refrigerator. 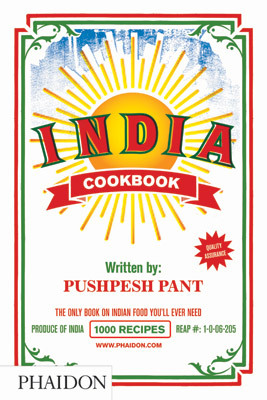 All recipes published in this page are from India Cookbook (November 2010 | $49.95), by Pushpesh Pant, Phaidon Press.